B3, which stands for Buildings, Benchmarks, and Beyond, puts the power of building energy data in your hands. 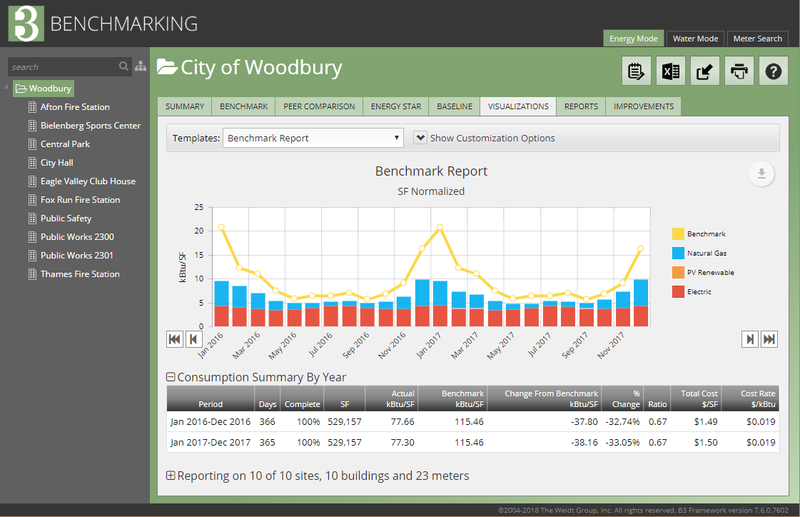 Using basic building and meter information, the online tool summarizes energy consumption, costs, and carbon emissions in easily digestible monthly and annual reports for Minnesota public buildings. By reducing energy consumption, you lower your operating costs – freeing up money for your organization’s core services. B3 Benchmarking helps you ensure your building is operating and performing as expected, and the tool screens buildings that would provide the greatest return on investment from any building improvements. Have you ever been asked, “How do your buildings compare?” B3 uses complex analyses that allow you to compare a building from four major perspectives. This multiple-angle approach helps you identify weak buildings and gives you the confidence that an identified poor performer is truly in need of improvement and will yield significant returns on investment. An engineering modeling comparison using DOE-2 simulations and B3 energy standards predicts expected energy use. An evaluation of a building to others with similar space usage, geographic location, and energy code provides true peer comparison. A simple 0-100 score produced by ENERGY STAR® Portfolio Manager analyzes a building against similar buildings across the US. A weather-normalized comparison of a building to itself over time provides monthly and annual analysis. In 2001, legislation in the State of Minnesota was passed to benchmark all public buildings in the state for a period of 12 months, and as a result, B3 Benchmarking was born. For more than 10 years, The Weidt Group® has developed the benchmarking application to be one of the most robust tools for tracking and managing energy use in public buildings. Currently, the B3 Benchmarking program contains over 7,500 public buildings with over 300 million square feet in its database representing 22 State agencies, 410 cities, 55 counties, 60 higher education campuses, and 214 school districts. The B3 Benchmarking system has identified over $23 million in potential energy savings in over 1,500 identified buildings representing about 30 million square feet of building floor area. View more information in this Current Statistics Report .